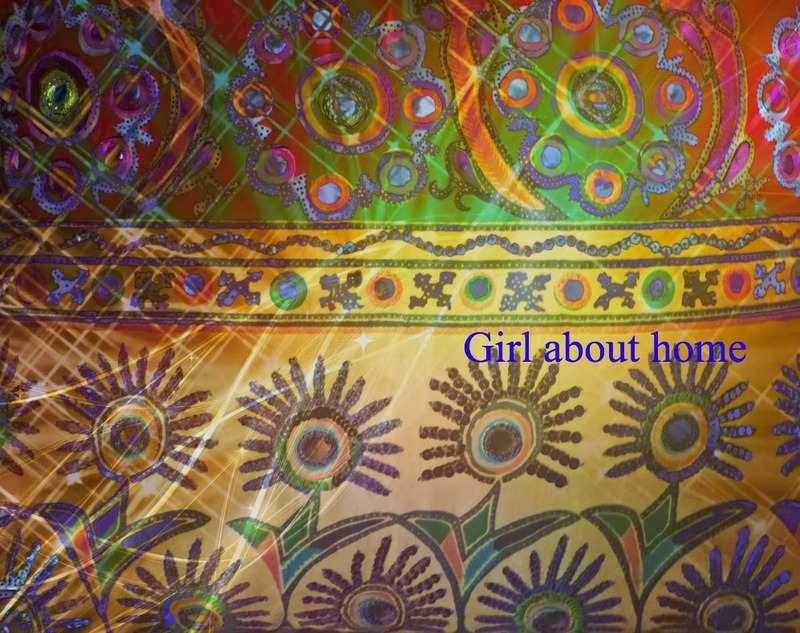 Girl About Home: Designer Diwali!! I am in the mood for color. Lots of color. Fuchsia, orange and turquoise, that's how much color. Throw in sheeny shiny mirrors and a dose of vintage fashion and the festive is already added to the festive season! Only this time it comes with a twist. It is among the first of what I am hoping will become designer collaborations. How to up cycle an old garment you cannot bear to throw away? 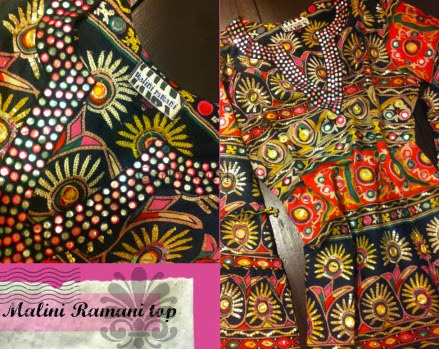 Spring cleaning a while back I came across this funky kurti I was very proud to posses a few years back. Now a bit frayed and a little weathered it has been in retirement for sometime. Only I could not get myself to give it away. Looking for ideas to do something with the garment, I thought of Kanika. A textile designer and entrepreneur who's work I have been in love with since I first saw her inventive work with traditional textiles. 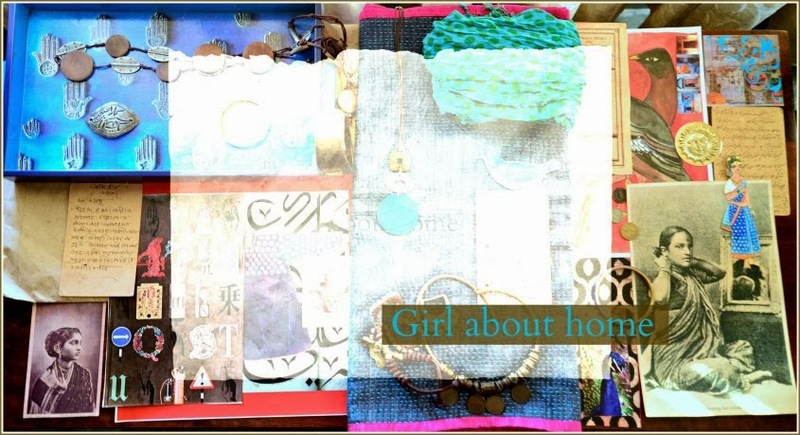 A phone call, a quick trek to her cute little design studio in Andheri, Mumbai and restless wait! 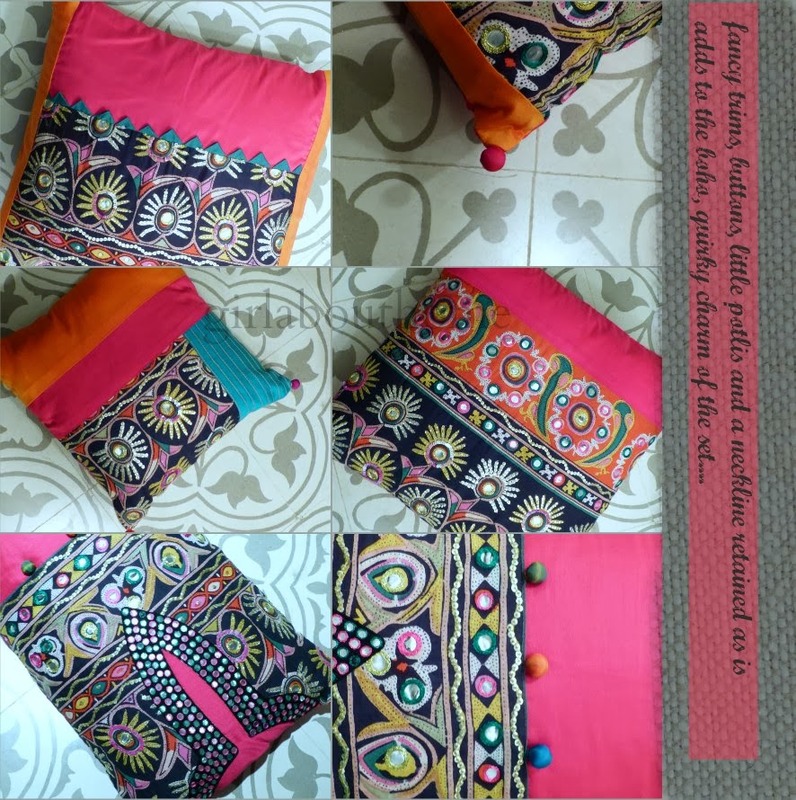 Until just a few days back, right in time for Diwali, I receive this package of a kurti transformed as if by magic..
Now, fun funky accent pillows!! The garment has come a long way indeed. 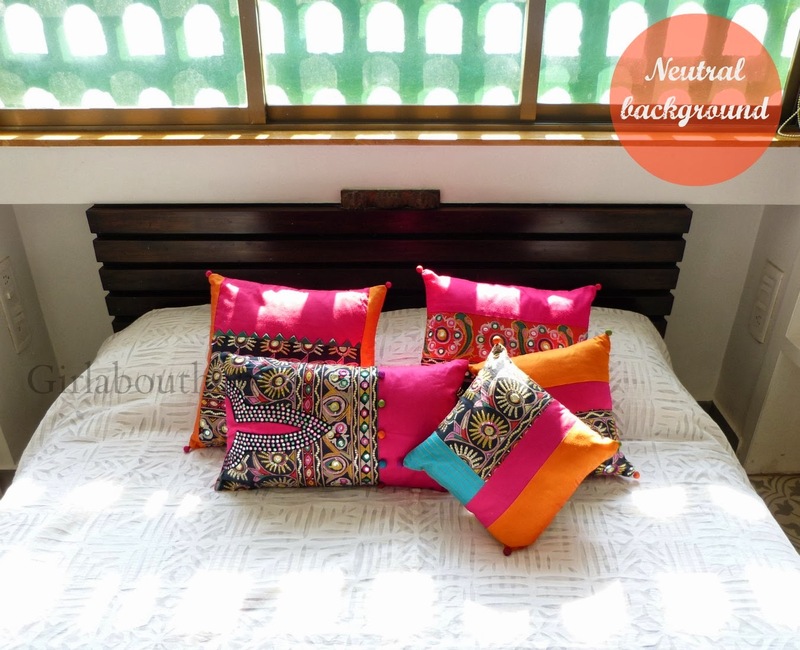 Five pillows, one batua and it does not end here! I have been kept waiting for a surprise which is till in the making ! How much fun can one sqeeze out of a single garment ? to add detail and an element of fun. 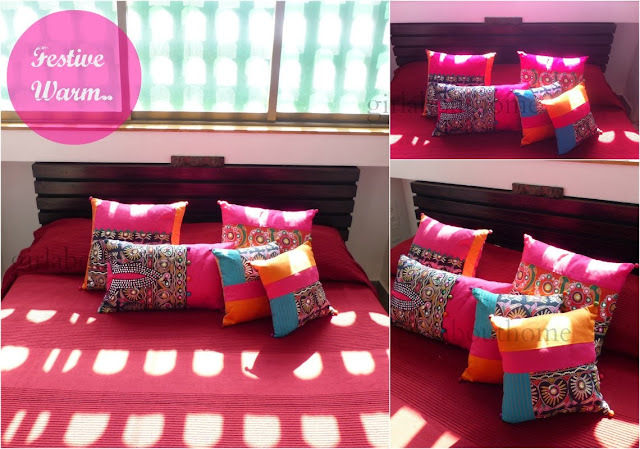 I made the cushions in assorted sizes so that they can be used in various settings." Against a neutral crisp white.. Warm and punchy festive splash..! The limitless goodness does not stop here. There is also a delightful little pouch made from left over fabric. Set against the warrior princess tray from another powerhouse of talent, Vineeta Nair it makes quite a picture. Non?! Be sure that the base fabric still has some strength left, else it will tear soon. stitch reinforcements may have to be added. The pieces must be dry clean/ spot clean only to make them last longer. Its a great way to recycle your favourite pieces so go ahead and raid your closet now! So there, the hoarder in me is punch drunk at the moment. 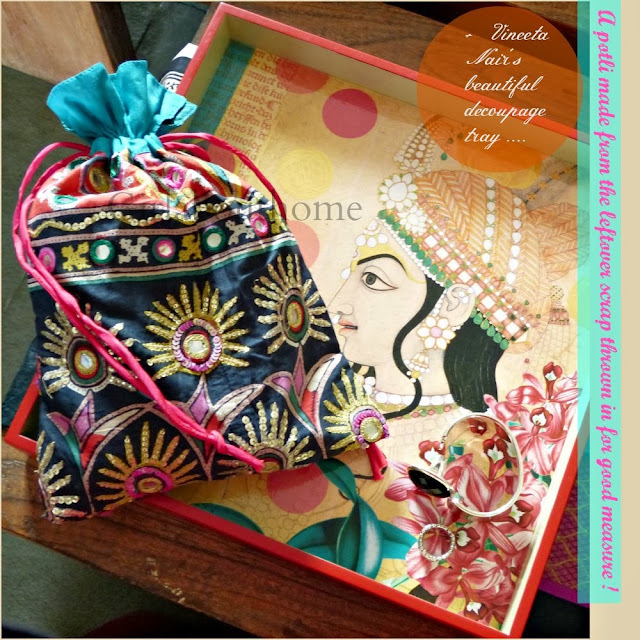 Do check out Kanika's incredible work here. Still to come on the blog, a home tour and a morning spent at Anek design's studio. Until then, please leave your comments and stay with me!!! Such a gorgeous makeover! brilliant idea, both of you! Lovely! Beautifully done by Kanika. I am very intrigued by the Jaali work outside your window. Thanks all. 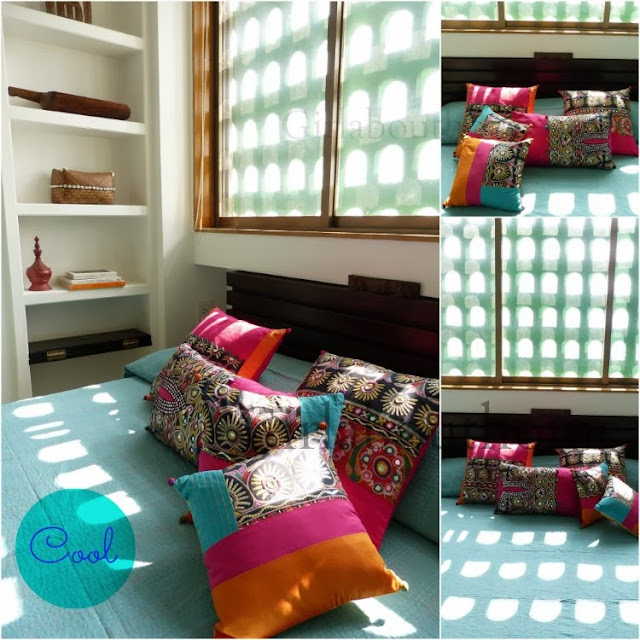 Kanika's sense of colour and attention to finish and detail is what made the project such a joy to be part of. Arch: The saree cushions must look so stunning! the jaali is part of the building facade. Old buildings have little quirks like these sometimes. Beautiful. I feel I am commenting after 3 years. And maybe I am. But this was just too precious to pass up. Fantastic work. And what a killer collaboration. My personal favourite is the piece which has the neckline of the dress. Sen.sa.tion.al. And thank you for that unexpected mention at the end of it all. This is a Flickr badge showing public photos from Chandan Dubey. Make your own badge here.